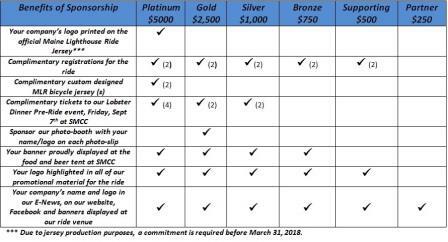 Sponsor the Maine Lighthouse Ride! Sponsor Board will be at the Finish Line Food and Beer Tent Great exposure to your name and brand to hundreds of riders, volunteers and family membersThe Eastern Trail Alliance (ETA) is proud to announce the 16th Annual Maine Lighthouse Ride (MLR), scheduled for September 7, 2019, based once again at the Southern Maine Community College’s campus on Casco Bay. The MLR is a coastal bicycle tour – not a race – in which a maximum of 1,200 riders participate (we cap attendance at that level, and sell out each year) who come from Maine, all over the U.S. and beyond, with proceeds allowing the ETA to continue its mission of supporting development of the Eastern Trail. This ride would not be successful without a lot of support - including the support of our many business and non-profit sponsors. Those sponsors have also benefited through exposure to many people - far beyond the riders themselves - from both southern Maine and from away. Can we explore a mutually beneficial sponsorship with you and your business or organization? Go here to read the 2019 Sponsor Letter, and the Event Sponsorship Levels & Benefits. The MLR offers an exceptional sponsorship opportunity for your business or non-profit. Sponsorship of this popular ride includes listing your company name and logo on our website at www.easterntrail.org, on a banner displayed at Ride Headquarters, Southern Maine Community College, and on all online promotional information regarding the ride. Please check our 2018 sponsor grid (below) for other sponsor opportunities for further exposure. Advertise to a large group of people having fun! They will remember and appreciate it!